GOP presidential hopeful Ben Carson has recently come under fire over a book that he wrote over two decades ago. Gifted Hands: The Ben Carson Story is an autobiography that takes readers through the retired neurosurgeon's impoverished Detroit upbringing, all the way to his successes as a pioneering medical professional. The book touches upon difficult times, as with Carson's self-proclaimed "pathological anger" while growing up, as well as more positive events that include his ascent to becoming one of Johns Hopkins' youngest pediatric neurosurgery directors. 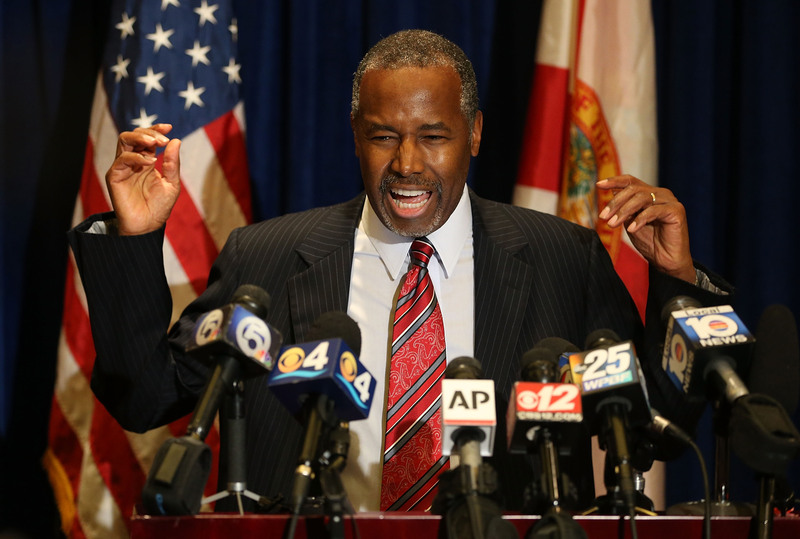 So what's going on with Ben Carson now that would call these claims into question? The candidate says he's unfairly being attacked by the media over truthful statements in his book. The criticisms began after CNN ran a detailed report interviewing 10 people that Carson had grown up with about his allegedly infamous temper. Friends who'd known him in elementary school and even up through high school and to the present day said they found it hard to believe that Carson would allegedly attempt to attack his mother with a hammer or punch at a fellow student with a metal lock wrapped around his hand, as he had claimed in his book. Former classmate Robert Collier described the presidential hopeful as "skinny and unremarkable" and added that Carson spent his time trying to fly under the radar. Such violent incidents would most certainly be noticed, especially an instance in which Carson says he attempted to stab a friend only to have his knife's blade break off as he made contact with the friend's belt. Carson's brother Curtis, who may be able to corroborate the presidential candidate's accounts, appears unwilling to talk to media, according to Carson. He has mentioned that other witnesses to the aforementioned violent incidents refuse to step forward as well. Thus, no matter what details may be obscured, it is ultimately Carson's word against others. The retired neurosurgeon's altering of key details has made his claims even more opaque. I don't want to expose people without their knowledge, but remember, when I was 14, when the knifing episode occurred, that's when I changed, that's when most of the people I talked to began to know who I was, they didn't know me before then. One of the biggest lessons that Carson touches upon in his book and especially as it relates to his violent outbursts is how faith had helped calm his temper and lead him towards his chosen career path of neurosurgery and into politics following his retirement from the medical world. Carson has repeatedly brought up those dark moments in order to explain how God had led him towards a more peaceful, centered life. It was after a particularly vengeful episode that Carson claims he opened up a bible to a passage about controlling one's anger, ultimately giving him pause and causing him to rethink his aggression. Yet another claim to come under fire involves Carson's life after high school while he was attending Yale. According to the candidate, it was in a Perceptions 301 class that a psychology teacher had told him along with 150 other students that their final exams were destroyed and they were tasked with retaking a new, harder version of the test. Carson was the only student to stay in the class as his fellow classmates streamed out of the room. For that, Carson claims, he was rewarded with a photo in the Yale Daily News as well as $10 for being the most honest student on campus. Why could we find it and they could not find it? And why do people put this stuff out there to make the accusation to try to make somebody seem dishonest, and then when it is disproven, 'Oh, well, let's talk about this. Oh, well, you said this when you were in kindergarten.' Give me a break. I mean, there's so many important things that need to be talked about. Carson is attempting to turn the ongoing media coverage of his autobiography claims into a net positive. He highlighted his recent fundraising gains in a tweet that he concluded with "thank you biased media." Though the candidate has described these incidents of intense media scrutiny as nothing more than a distraction, he's readily taken to political shows to speak in detail about them. On Sunday alone, Carson was on three different morning shows and mentioned incidents of Gifted Hands coming under fire every single time he sat down for an interview. It's a strange situation when you talk about hitting your mother on the head with the hammer. It's a weird deal going on and I hope it all works out because I don’t want to see Ben have problems over this stuff ... He said he has a pathological disease in the book [Gifted Hands]. That's a very serious problem because that's not something that's cured. That's a very serious thing you have to live with. Fellow candidate Jeb Bush also came to Carson's defense, saying that he believes the retired neurosurgeon over the media and expressing sympathy towards what Bush sees as intense vetting. GOP presidential hopeful Chris Christie has shown similar solidarity and says that what voters believe is ultimately what matters. So far voters have shown that they are still very much in support of Carson. He trails by just two points to Trump in a recently released CNN/ORC poll of Republican candidates.